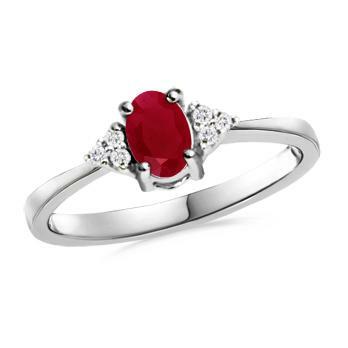 Red represents the color of the heart, so rubies are often associated with love and passion. This symbolism makes rubies a great choice for an engagement ring. This type of ring is not only stunning, it can also be a more affordable option than a traditional diamond ring. Ruby rings come in a wide variety of styles. From classic solitaires to rings with elaborate and unusual settings featuring diamonds, ruby rings can be found in styles to match any woman's personality and personal taste. What Finger Do You Wear an Anniversary Ring On? Square-Cut Celtic Ring (R5SQ2644): This ruby ring features a center square cut ruby with twenty diamonds around the band. The design incorporates a Celtic Knot design around the center stone. This ring is available in both white and yellow 14k gold, and it's priced around $750. Three Stone Round Style (C2634): This modern ring features a round center ruby surrounded by two smaller rubies on each side. The band contains eight diamonds. This ring is set in white or yellow 14k gold and is priced under $600. Ruby and Diamond Ring (R26395SQ-WRUBY): This popular ring features a square cut ruby center with a diamond on either side. There are also several small diamonds set inside the band for a unique look. This ring comes in both white and yellow 14k gold, and it's priced around $700. Jewels for ME offers several shipping options such as UPS ground or UPS 3 day select. All jewelry comes with a one year warranty against defects in workmanship or material. Items can be returned for a refund up to 90 days after purchase, as long as they are in their original condition. Customer reviews on the company's site are very positive, with many customers praising the company's fast delivery, great customer service, and quality jewelry. Ruby Knife Edge Three Stone Ring: Priced just under $4,100 for 14k gold, this three-stone ring features a ruby center stone and two bezel set diamonds, one on each side. It is also available in 18k gold and platinum. Micro Pave Halo Ring with Ruby: Starting around $3,000, this ring features a bezel set ruby center surrounded by 34 diamonds. It is available in 14k gold, 18k or platinum. Trellis Round Ruby Solitaire: Priced around $2,300 for 14k gold, this ring features a solitaire ruby set in a trellis shape basket setting. It is also available in 18k white or yellow gold or platinum. deBebians offers free FedEx shipping, 30-day returns, free appraisals, and a free ring box with each order. All purchases are fully insured and can be done as a rush order for an additional fee. All gemstones from deBebians are of AAA quality and are genuine and natural. Accent and side diamonds are all of good quality, and they're cut for brilliance and clarity. deBebians' customers rave about the quality of the jewelry, as well as the excellent customer service. All rings come with free lifetime maintenance. Three Stone Ring: This unusual ring features three round natural rubies surrounded by .29 total carat weight of small round diamonds set in 14k white gold. Priced around $1,220, it is a lovely option. 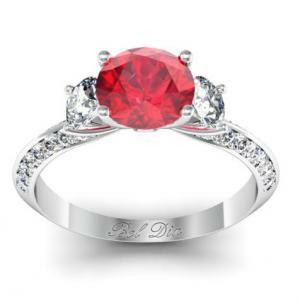 The Classique Ring: This ring features a natural AA oval ruby center and six diamond accents. It is elegantly set in 14k white gold and is priced around $1,400. Higher and lower grade stones are also available, with varying prices. The Twilight Ring: This ring features a natural round ruby accompanied by six diamonds scattered on the 14k yellow gold band. It is priced under $900 when set with an AA grade ruby. Higher and lower grade stones area also available, with the cost varying based on the quality selected. Angara offers free shipping and guarantees the value and quality of each purchase. Women's Wear Daily mentioned that Angara's prices are generally 35 to 50 percent cheaper than at traditional retailers. Site reviews mention the quick shipping and high gemstone quality, as well as the uniqueness ring styles available. Grading: Rubies are graded according to color, cut and clarity. The deepest darkest rubies with an excellent cut and polish receive a AAA rating, while lighter, pinkish stones with good cuts and polish may be closer to a B rating. Durability: Rubies are durable stones that are easy to wear and care for. 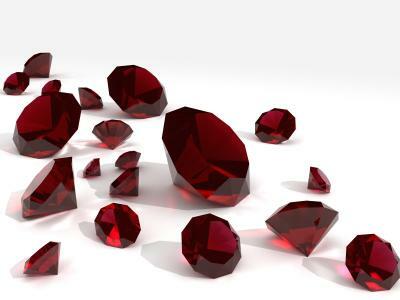 Weight: Rubies weigh more than diamonds and, due to this reason, look smaller compared to a diamond of the same carat. Natural vs. synthetic: Some rubies are natural, while others are lab-created; verify which type is in any ring you consider. Natural stones cost more than synthetic rubies. Ruby rings come in a wide variety of styles from ones with accent rubies to those with stunning ruby centers and side stones. 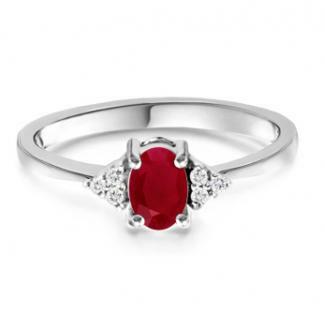 You can show your enduring love and passion by giving a ruby engagement ring to the one you love.